If you didn't see them, you've probably heard about the images that came out recently of the former girlfriend of NFL player Greg Hardy. If you haven't seen the pictures, they've been described as upsetting, disturbing, and graphic. If you don't want to see them for yourself, pick one of those words and it would be accurate. But this isn't an article about what's already happened in regards to Greg Hardy, it's an article about what needs to happen from now on in the NFL. The short version of the story is this. Greg Hardy was arrested and convicted of assaulting his former girlfriend. He sat out last season in the wake of the NFL's sudden pose of standing up to domestic violence after the video of Ray Rice knocking out his fiancÃ©e in an elevator. Then the charges were dismissed on appeal, Hardy reached a settlement with his ex girlfriend, and the NFLPA fought to get him reinstated, which they did. Then Dallas signed him to a contract, and the rest is history. But it's not history. It's the present that's the problem. And the future that needs to prevent this history from repeating itself. The images that came out of the bruised and beaten woman, that's your image NFLPA. The angry reaction and the disgust that's come along with those photos, that's your reaction NFLPA. Everyone has been quick to blame the NFL for not doing it's part to discipline players for off the field incidents. And to a point, the criticism is right. Roger Goodell has been far from accurate when its come to disciplining players. Some are blaming the Dallas Cowboys for signing Hardy to a contract and standing behind him after a sideline incident where Hardy slapped a clipboard out of an assistant coaches hands then got into a verbal spat with Dez Bryant. If you want to point the finger of blame towards anyone as to why Greg Hardy is wearing and NFL uniform this season, don't point the finger at Goodell or Jerry Jones. Point the finger where it should be pointed, at the NFL Players Union. The image of NFL players being wife beaters and thugs is on the NFLPA. They're the ones who fought for Greg Hardy to be allowed to play again. That tainted image of what professional football players can get away with, that's what the NFLPA is encouraging by getting Greg Hardy reinstated. 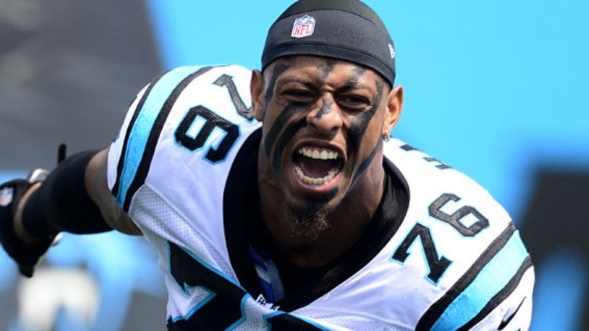 When I see Greg Hardy playing on a Sunday it disgusts me. When I watch a Cowboys game, I won't lie, I hope somebody cuts his legs out from under him and tears his ACL or MCL or anything else that will put an end to his playing career. That sounds bad, doesn't it? That might make me sound even slightly barbaric to wish major injury on someone. But it's an opinion I'm sure that is shared by many NFL fans. It's probably shared by more than a few non NFL fans too. I'm not one to agree with Cris Collinsworth too often. But what he said during Sunday night's game is something I agree with 100%, that it's time for the NFLP to take a stand if something like this ever happens again. There should never be a next time for the next Greg Hardy. This should be the last time. The next time should be, no it has to be, the end of the NFLPA standing behind a convicted criminal who assaulted a woman. That anger. That backlash. Those disgusting pictures. That's your doing NFLPA. Now it's up to you to change it going forward.